In previous games of Chain of Command I had happily mooched off of friend John's awesome and expensive terrain. 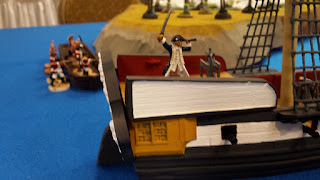 Last week, though, I ran a game for the New Hampshire Wargames Alliance and had to bring my own. While the players had fun the game looked just awful. I had some felt forest templates in the car and some 40K ruins appeared out of nowhere to serve as rubble. As a quick aside, it was fun to see that the basics of CoC can be taught quickly and that players can at least get a sense of the game on a first try. I left out artillery and armor but still, it's a positive commentary on the game design's elegance. The players were at least neutral and I'm hoping for some more gaming soon. 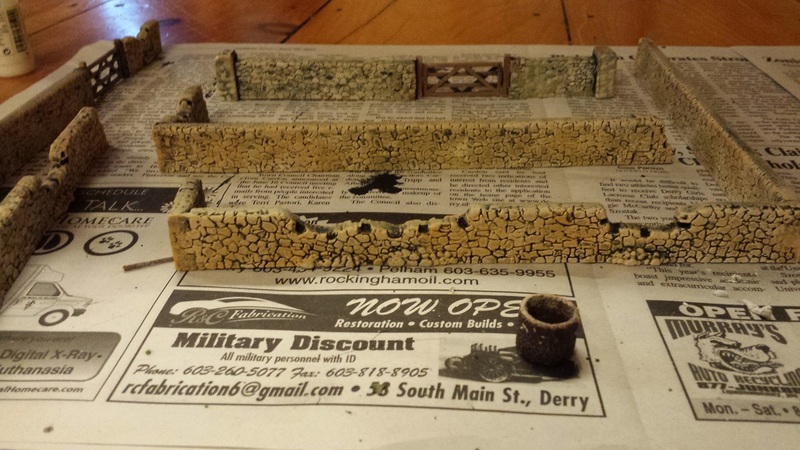 This week I resolved to whip up some nice terrain. If people are going to try again they may as well have a nice table to admire. As the family is away I had access to all the floor area of the house. It's hard to imagine that sort of freedom to leave plastic, paint, and gear everywhere and I'm happy to say it is just as fun as you might imagine. The clean up, undoubtedly less so. 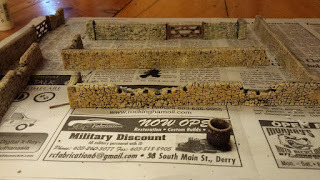 First on the agenda were some Italeri 1/72 scale stone walls. 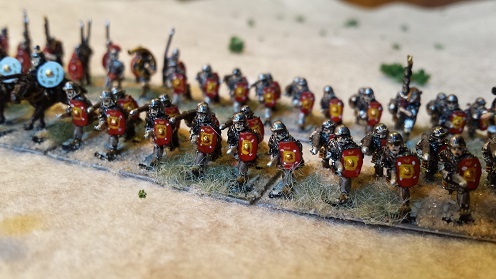 These had a good amount of flash and are scaled pretty high, almost at head level of 1/72 foot troops. Not terrible looking though, and nice and hefty dense plastic. And better sculpted than the Pegasus walls I had painted up a while back and then forgotten about until I finished the new set. So now I have More walls! 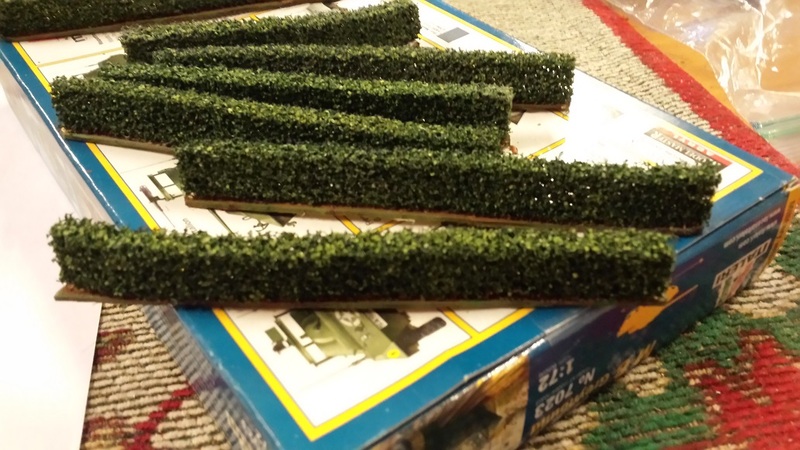 Next were some German made model train hedges. They come as strips and you can cut them and then mount them on tongue depressors. They have to be flattened overnight since they're sold folded and carry the curve. They're shedding flock already so I suspect I'll be reapplying and sealing with some dilute white glue. Pretty though. I think I may have some hedges already as well, but I haven't stumbled across those yet. 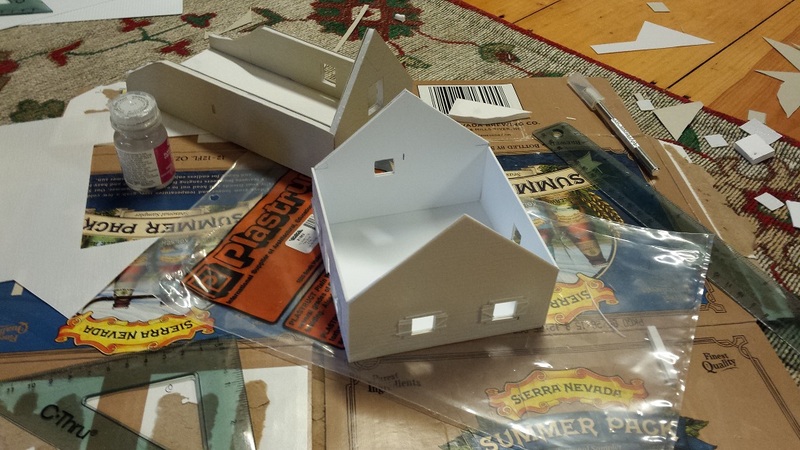 Finally I went out and picked up a pile of styrene with which to build barns and houses. There is mdf 1/72 terrain and a few plastic models from Italeri but I was in a mood and did have the house to use as a workshop. The barn is based on foam core, the house is layers of stone sheet on top of thick sheet styrene. The latter looks better although it burns though styrene at a lively pace. In all it's been fun to see how productive you can be in a few days with no distractions and no expectations of actual productivity in the sense that a spouse might use. I've been fascinated by pulp or adventure style miniatures games for some time now. The theme is always alluring enough- play a minis game as Dr. Who, a member of Danger 5, or a Cthulhu investigator. At the same time I always wonder if the experience is really going to be close to the ideal, or if it's better just to role play. 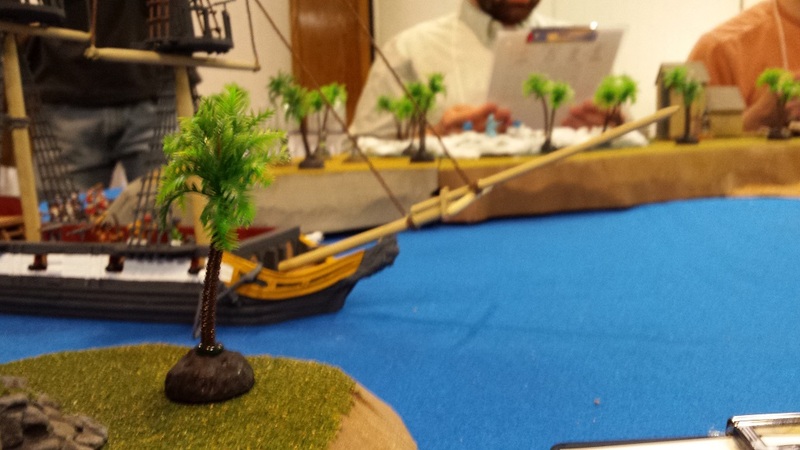 On Saturday afternoon I got a chance to play a pirate themed game using the Pulp Alley rules. These had been favorably reviewed on Meeples and Miniatures and I was excited to give them a try. In a sense it would also be interesting to compare the game to the Muskets and Tomahawks game, which was skirmish wargaming but with a good taste of adventure gaming as well. The game was called St. Pomme de Terre- the Governor's Daughter. My faction represented royal troops trying to retrieve the governor's daughter from a band of pirates. 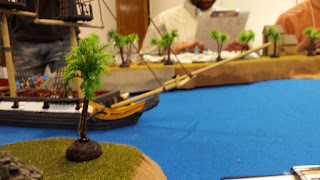 We were to approach the pirate lair in a ship and a longboat and then travel through a swamp or along the docks and eventually defeat the pirates. Along the way we could earn victory points for capturing treasure, defeating enemies, and hopefully rescuing the kidnapped woman. On a positive side the game was well thought out and a lot of fun. There were swamp creatures, colliding ships, cannon fire, people falling off of masts, sword fights, gun fights, and foggy graveyards. The royals got off to a miserably slow start and barely made their way across half of the terrain due to falling down hills, getting trapped in swamps, and probably being too cautious. Eventually we ended up in a mammoth brawl on the outskirts of town but the sun was at that point setting and our mission a bit of a failure. Still, both pirates and royals had a good time. That being said, I can't say I'm sold on the rules. There is ten times as much detail regarding the figures as there is in Muskets and Tomahawks. That translates into a game that's about ten times slower to play. Each figure may have several unique abilities and you have to remember them, as well as watch for your opponent's secret traits. Plus you can play cards that inconvenience or sabotage your opponent's play. The result is, again, a slowish game. It's also noteworthy that I felt like Muskets had as much or more of a narrative through the game. My vaguely defined Indian party had a wild adventure without detailed special rules and characteristics. The narrative flowed from the game play itself. In the Pulp Alley game I spent quite a lot of energy trying to remember which figure was good in a fistfight, which was a sharpshooter, and which was hard to hit. In the end keeping track of all that was more of a distraction than a game enhancement. In the end, though, my critique is with the rules, not the game and the people who ran it. I'd certainly play it again and they did a bang-up job setting up the adventure. But I didn't walk away wanting to buy the rules. 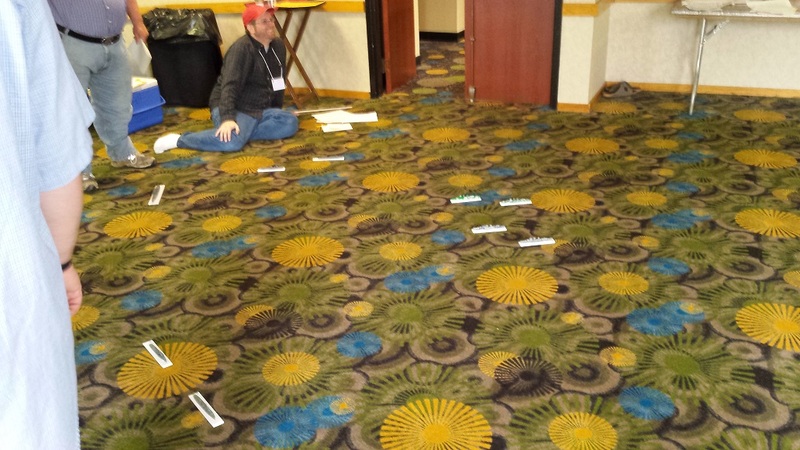 This year I had another chance to play the amazing Fletcher Pratt Naval game, run again by Wes Decampos. This game takes place in an entire ballroom and is played on the floor with large scale ship models. It's a complete spectacle. What makes this yearly event so enjoyable, however, is that Wes runs a tight game. He supplies a pile of handy charts, he explains the rules quickly and clearly, and he's done this enough times to avoid rules lawyering, complaints, quibbles, and whines. In this scenario a convoy of Japanese ships are attempting to land troops on Guadalcanal. The Americans must intercept them. As a twist the encounter takes place at night so spotting is difficult and some of the engagements may take place at unusually close range. The modified Fletcher Pratt rules are simple. Ships move, maneuver, and then fire. Each player picks a target and then guesses the range, often up to twenty feet. Then Wes checks the actual ranges and if you guess correctly you inflict damage on the target. Larger ships can only be damaged by larger guns but every ship is vulnerable to torpedoes. My goals for the game were twofold. Based on prior years I vowed not to collide with a friendly ship and not to collide with torpedoes. I would earn bonus points if I could avoid being sunk outright. The game unfolded and moved along at a nice pace. I commanded a heavy cruiser, the Baltimore. A cluster of American destroyers were deluged with torpedoes and went down pretty quickly. I engaged a nearby Japanese light cruiser and scored some lucky hits while avoiding his torpedo fire. Just to mix it up I fired at and scored one hit on the Japanese battleship which scratched some paint. That was enough to teach me to stick to light and heavy cruisers for the rest of the game. It felt a little cheesy to take on smaller ships but that's probably what would have happened historically. The light cruiser's captain was a good sport at least! At the end of the game the Americans held the field. Or waves. I had avoided collisions of all sorts and was still afloat. 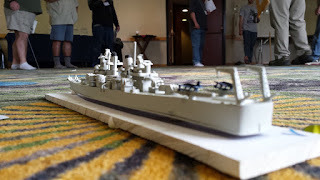 It had been great fun to move big toy ships around a huge ballroom and I'll do my best to play again next year. The Huzzah wargame convention in Portland, Maine, has been a personal gaming highlight for years. 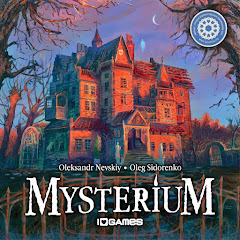 The players attending are typically fun and friendly, the games usually look terrific and the rules are interesting. This year was possibly the most fun yet. The first game I played was Bloody Tomahawks- Supplies for the Outpost. 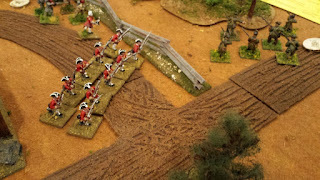 This was a scenario for the popular Muskets and Tomahawks rule system and was run by Earl Richards. 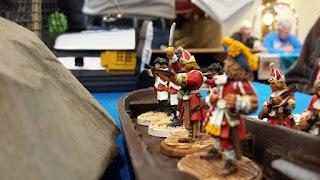 I was curious to give these rules a try as our club has started assembling some troops for North American combat, circa King Phillip's War and onwards. 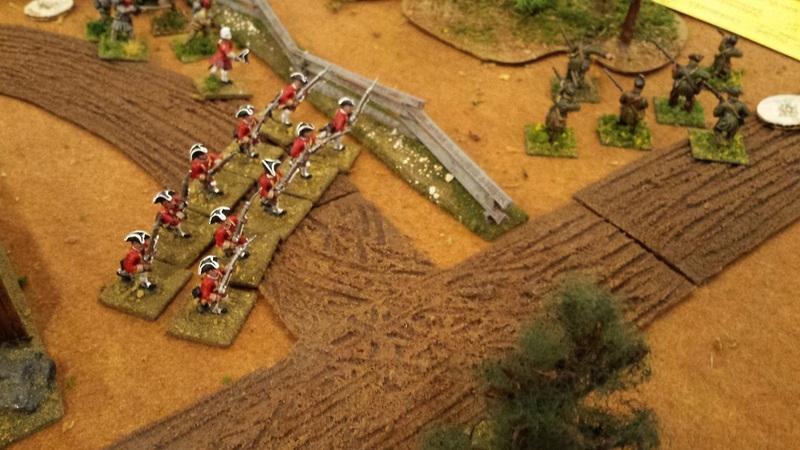 In the scenario a British colonial outpost is awaiting supplies. The French are trying to intercept the convoy. Both sides have local irregulars and Indians assisting. I was assigned a party of Indians fighting for the French. The game ran fast and smoothly. We needed maybe ten minutes to learn the rules and there were few questions after that. Parties are activated by a card draw and then have a number of actions. Different factions may have different movement rates, firearm skills, and ability to shrug off averse events. 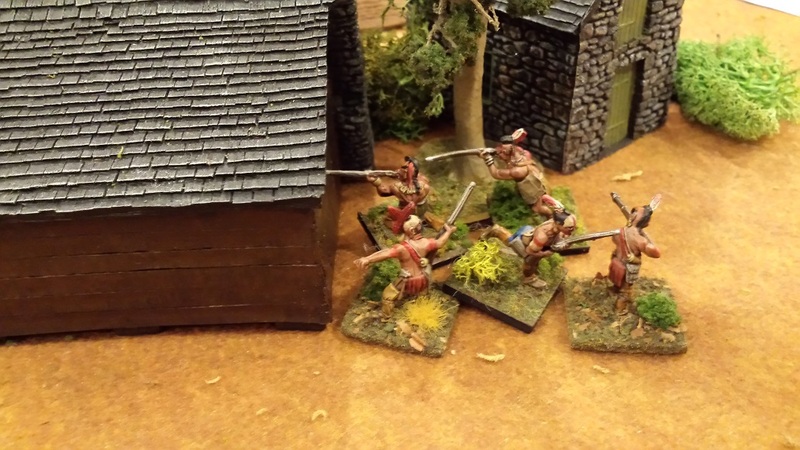 In game play the British regulars were slow as molasses but deadly at ranged fire. The colonial rangers were faster and could move through the woods easily. 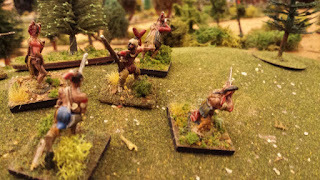 My Indians were exceptionally nimble but prone to break away if the suffered too many casualties. In terms of narrative and play we had a terrific time. The regulars confined themselves to open fields and roads. The Indians and rangers dashed through the woods and tried to make the most of their mobility. My troops were able to run to the town and start firing houses but I unwisely led them into the open and they disintegrated under fire from three directions. On the whole the game was a lot of fun, both as a simulation and as a quasi-role playing adventure game. The rules were intuitive and quick to teach. At the same time there was some nuance to each faction and you had to play carefully to accomplish your goals. We had six or so players and everyone stayed engaged and entertained. 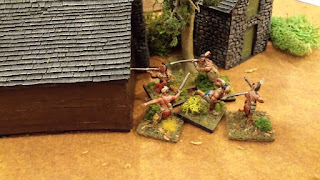 I'm excited to have a use for my Wargames Factory Indians and looking forward to playing some Muskets and Tomahawks in Malden soon. Ancients Rules Update- To the Strongest! Not long ago the club was having its' monthly DBA ancients game day. Readers may already be aware that DBA is an old and popular set of game rules for playing out ancient and medieval battles. During the games there were several tense and unpleasant moments, however, in which people had trouble agreeing on exactly how the small miniature figures could move on the table. At one point things almost grew ugly. Let's ignore the implications regarding grown men who might get angry about a game involving toy soldiers. Each genre seems to have rules that cause arguments. World War 2 games break down when dealing with assaults and air support. Ancient battles games suffer when describing charging and movement. You may be playing on a six foot long table but a millimeter's difference in placement can have huge implications as to who wins a battle. This dynamic is one of the things that author Simon Miller attempted to address with his To The Strongest! rules. To the Strongest! 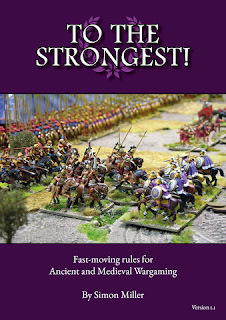 (TTS) is a set of rules that allow you to play out ancient and medieval battles on a tabletop. You need two armies made up of eight or more units. The play takes place on a board formed from a grid of squares measuring 8 x 12. The square grid removes any issues regarding placement on the battlefield. Units are clearly "here" and can clearly and unambiguously move "there." TTS has other novel game mechanics. Anything involving chance is resolved using ordinary playing cards. Success at some task is accomplished by drawing a card, The harder the task, the higher a card you need. In our playtesting we found this speeds up the game more than you'd expect. Dice are fun. They also fall from the table, roll around, hit things, get stuck under terrain pieces and generally eat up a lot of time to use. Flipping a card is the same as rolling a ten sided die, just a lot quicker. Warmaster 10mm Back on the Table! TTS has several elements that will be familiar to miniature gamers. Units on the table can be represented in any fashion- the exact number of figures on a stand doesn't matter. You could use wooden tiles to represent units, or German flats, or even paper cutouts. For our playtest games we used my old 10mm Warmaster Ancients stands. There are also familiar damage saves, overall morale levels, and a need to use leaders for important moments in the battle. My overall take on the game was very positive. The mechanics themselves practically fly along. I taught an eight year old how to play in a few minutes and rules checks were minimal. That being said, playing well demands some thought. You are rewarded to keeping a good battle line, for proper use of skirmishers, for having a second line and some reserves. You need to manage light troops as they are helpful but fragile. Leaders are given simple rules with some subtle implications that cause Roman armies to behave quite differently from Briton ones, for example. There is a push-your-luck mechanic to giving orders but you will always get to move your troops, unlike some turns of Hail Caeser or DBA for example. Finally, the game works one on one or with larger groups. I've been looking lately for games that are fun, challenging, and drama free. For my World War 2 needs Chain of Command has hit the spot. To the Strongest! looks to be a playable and fun ancients rules set. It's simple enough to teach to kids but deep enough to give a challenging game to experienced players. The rules are well written, packed with great diagrams and photos, and absolutely priced to move. I'd recommend taking a look. Recently we were faced with the question of what activity to feature at our son's 8th birthday party. My gut instinct is to let children play outside until they are completely covered in watermelon juice, snow, or mud (depending on the season), but the wife advised me that modern families provide some sort of activity or event to the kids. My number four option was to have them all build plastic models of Japanese Giant Robots. Poor Amy considered whether the mud option might not be too terrible after all but eventually consented. I went through Amazon and tracked down a crate of Gundam High Grade Universal Century models. I then opened each box and partially separated each piece from the sprues to make them easier to detach. My wife observed the detailed instructions, all written in Japanese. Then we laid out some tablecloth so the tiny pieces wouldn't get lost and let four 8 year olds go at it. The end result was four highly entertained boys who needed about three minutes of coaching before efficiently building their models. At the end of an hour and a half or so they were more than half way done and all the models were finished at home that night. Each of the boys walked away feeling excited and proud and there were no meltdowns or frustrated faces. So other than feeling happy that my harebrained scheme worked, what's the lesson here? Mainly, the lesson is that the Lego generation has been taught to build plastic models. Kids of my generation built Monogram and Revell tanks and planes but I suspect that the next wave of children would have been baffled by a plastic model. Now, however, you have literally millions of boys and girls who like nothing better than receiving a bag of pieces and a set of graphical instructions and then building away. Four of those kids took a look at the Gundam instructions, realized they were just like Lego instructions, and had a great time. A few secondary thoughts come to mind. It was lucky that I knew which models to buy. The Tamiya High Grade Universal Century line is outrageously well engineered- the models fit together well and all amazing when completed. There is also the Real Grade line, which is newer, easier to find, and still simple enough for an eight year old. It's also helpful not to wait till the last minute. 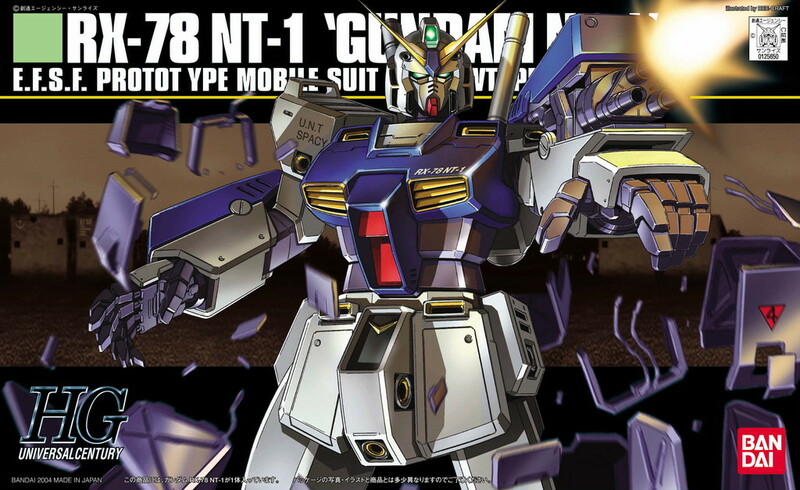 Hobby Link Japan is the best online source for these kit. I've used them often. Shipping from Japan can add some days to your delivery. Amazon is another source but shipping times can vary hugely and some sources may be unreliable in terms of how quickly they respond. Finally, local stores may carry the models. In Nashua The Comic Store has an awe inspiring level of in store stock, but at a higher price than through Hobby Link Japan. Building models is fun. You learn a whole variety of crafting skills. You can learn history, art theory, all sorts of things. And from my perspective it was very satisfying just to share a love of my own with a bunch of kids. 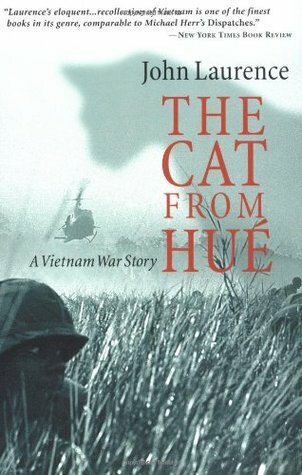 I just wanted to put in a quick plug for The Cat From Hue, a Vietnam War nonfiction book I'm working on right now. I'm beginning to divide my Vietnam reading into two categories. The first includes official histories, after action reports, and other government documents. These tend to be very helpful in detailing locations, dates and times, and overall quantifiable events. The reports often include hand drawn maps and other bits of information taken directly from the scene and sometimes deliver a good amount of granular detail. sites dedicated to various regiments and units stationed overseas. The personal histories are often very detailed and help paint a picture of a particular scene or even span of minutes. The Cat From Hue falls into this second category. The Cat From Hue was written in 2002. As I make my way through it I'm finding it uneven but occasionally extremely valuable. 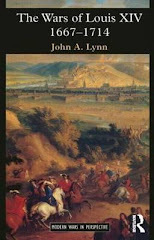 In its' best segments author John Laurence writes as if he was composing shortly after the events in question. Thus, Morley Safer is introduced as yet another correspondent. Joe Galloway is introduced with no reference to his future role in historical reporting. Ernest young officers make comments in 1965 without any authorial winking or eye rolling. The result for me is a reading experience that feels authentic. I can supply hindsight on my own, but Laurence supplies the feeling of being there and not entirely knowing what the next week or year will bring. That being said, the material is least helpful when Laurence goes ahead and supplies a meta narrative. For example, he steps aside to explain why he feels that his reporting could never have been truly objective. While this is true enough I would look for that level of discussion in a different book, or in a later section of this book. It feels intrusive in the middle of the historical narratives. Another issue I have with the book is that it starts in 1968, and then jumps back to 1965. The 1968 Hue material is oddly not the strongest and I would have been just as happy to place it chronologically. I think the final take is that a bit of editing to help place the content would not have hurt. I read a personal history to get a better understanding of how events took place at an individual level. An after action report may describe a squad as having moved from point A to point B but it will neglect the human dynamics, details, and costs of that journey. The Cat From Hue touches on a good number of well-known events and adds first-hand experience to the larger picture. I'm a pediatrician and gamer in Pelham, NH. I like to write about games and gaming with a focus on families and younger players.